After driving around and getting lost outside of Lehi, Utah on my trek to get pictures for the rest of Salt Lake's towers I headed back towards Provo on my jaunt around Utah Lake. After passing at least half a dozen police cars within about 3 miles, I was on a long open stretch of road and to my left was Utah lake and this very peak, er, mountain. Now the road to the top of West Mountain was also no easy feat to find. The confusing road system that is Utah valley makes this mountain accessible by a few roads, but the main one is buried in others. The road itself is in very bad shape, and it reminds me of several roads I've been on in Wyoming's back country, searching for distant towers in Sweetwater County. My shocks were already in bad shape, but after the first mile or so up the mountain, they became virtually useless as the road turned to rock. It amazes me how such towers are constructed and materials brought up here when the road would crush any sedan any day. Luckily the RTLI mobile, failing as it is, was up for the challenge, and as pictured above, made it in one piece. Now on to the mountain. 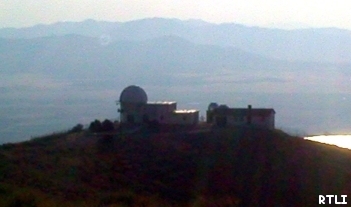 The picture at the top is looking north toward Salt Lake (in the far distance) at the majority of the towers on the peak. Directly behind me and not pictured on this page is a BLM tower and a tower that sits on the other side of the peak. I did not want to brave yet another unstable road just to get a picture of it. If you were me, you wouldn't have gone either. On the left side of the picture at top, is an old AT&T long line transmitter, mostly used prior to the invention of fiber optics. 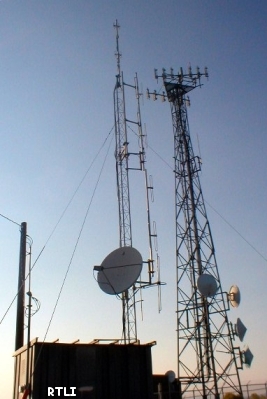 It carries microwave transmissions to other similar towers in the area. To the right sits a Cingular owned cell phone tower and a translator we'll see in a minute. To the right of that is a cell tower owned by Verizon, as well as more towers we'll see in a moment as well. T-mobile owns the shorter cell tower at right center in this picture. 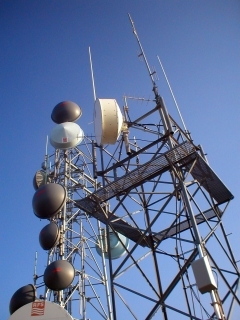 This multipurpose tower houses local services but is more predominantly a translator for the popular country station KEGA 101.5 It isn't really a translator either, more like a booster station, known as K252DB 98.3. The reason I say booster is because KEGA has no problems reaching the site at question with one of its many other boosters in the area. In fact on West Mountain, we are line of sight to the Provo, Salt Lake, and Ogden boosters of KEGA. Oh well. As of last check, the station was on the air. It is licensed to "Rural Utah County" of all places. Why didn't they just say Payson or West Mountain, Utah. The FCC is crazy some times. A sticker for U92 also indicated this tower's previous use. I presume the yagi in the center of the tower is K252DB. At the top of this tower is KTCE 92.1, the only relatively big station on the mountain. The STL for KTCE is on the bottom of the tower, pointing north in this picture. 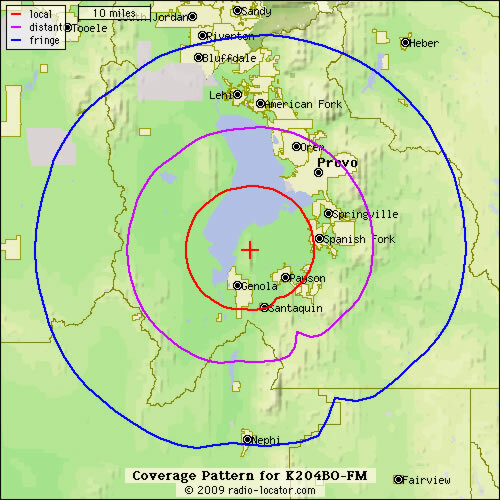 The stations studios are actually in Provo, not the city of license Payson. KTCE is a hot ac format station with a satellite format similar to "Best Hits Best Variety". I have heard this before, KYCS in Rock Springs has the same network. In fact, on Saturday nights, KTCE has the same feature, Retro Saturday Night. Back to the tower though, now that you know the programming. KTCE (I think) comes from the two white bays at the top of the tower. The FCC and Michael say that they are "Jampro" brand, and are circular polarized. This explains why KTCE makes it into Salt Lake so well, while 89.5 from the same mountain does not, without a little coaxing --no pun intended. K208BZ 89.5 FM (KBYU) from Spanish Fork, Utah, also houses its transmitter on the lower part of this tower at left. I'm guessing it uses a Yagi, not a bay. It may very well be the Yagi on the ground I found while up there, but I'm betting it is center tower. We may get new information on this soon. K208BZ is as I said before, a translator of KBYU 89.1 from Provo (whose tower is actually on Farnsworth). The signal is good in Utah County, but very weak at the Salt Lake receiving location, even though I am nearly line of sight. One more thing about this tower... I mentioned in the caption that it was a U92 translator. Believe it or not, KTCE was not always what it was. KUUU (92.5) had a translator here that provided service to the Utah County and south area. Now we'll move on to the next tower. Remember the Cingular cell tower seen in the picture at the top of this page? Well here it is again to refresh your memory. 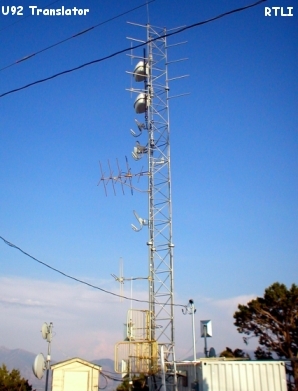 But this tower isn't the focus of the picture, no its the shorter FM station K202CC from Provo we're looking at. 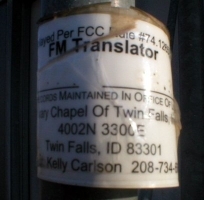 This FM translator is owned and operated by Calvary Chapel of Twin Falls, Idaho and operates on 88.3 FM. K202CC is obviously a religious station, broadcasting a mere 10 watts from this tower. What is strange is that this station overpowered my Ipod's transmitter on the way up to the mountain, but did nothing when right next to the tower. It's parent station is KAWZ from Twin Falls. The tower is a meager 33 feet off the ground, but the surrounding elevation gives it a HAAT of 2131 feet. Continuing southward on our journey, a few feet later we find yet another tower which can be seen at left below. 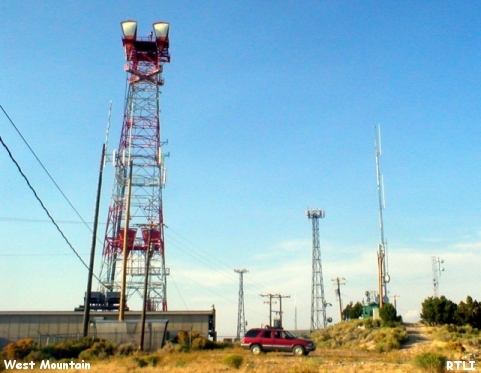 This tower is operated by Utah State University and is an NPR translator station known as K204BO on 88.7. This station, like the one above, battled over my Ipod on the way up the mountain as well, but was silent as soon as I reached the top. It too broadcasts 10 watts but is higher above ground at 89 feet. K204BO's coverage (at ten watts) is surprisingly good considering Utah's mountainous terrain. As you can see from the coverage map below, it covers a good chunk of the Utah valley, but is patchy if not impossible to hear in Salt Lake City. This is why I set my Ipod to 88.7 so no interference will jam it as per usual. As of the last writing, K204BO was still on air, carrying programming from the main... KUSU, in Logan. Some translators carry HD Radio programming like the main, but K204BO does not. One other non tower building that is up here on West Mountain is an observatory aptly named "The West Mountain Observatory"
Here are the other towers on the mountain, with the exception of two that can not be seen in the photos above. Thanks to Michael in Wyo (our esteemed Evanston tower hunter) for some of the info on this site. All images/content on this website is copyright Ubstudios/RTLI. Re posting of this material without permission is not allowed.